As the royal engagement draws to a close this April, more couples are adapting Will and Kate's approach to weddings. are beginning to realize the benefits of a brief engagement period. As Olivia Barker described in her recent USA Today article, modern day couples are beginning to realized the benefits of a shorter engagement and have begun to abandon drawn-out wedding planning. "We just really didn't see the point in waiting when we knew what we wanted," says Sabartinelli, 26, a cultural arts coordinator for Grand Junction. She is one of a bevy of brides bucking her generation's trend toward engagements that can last as long as, well, many marriages. Consider the most famous contemporary courtship of them all: Kate Middleton and Prince William, who will have been betrothed all of six months by the time they say "I do" on April 29. With these rapidly arranged nuptials, no shotgun is required. (Even though friends and family often insist on probing: "You sure you're not pregnant?") And couples aren't necessarily hastening their march to the altar for old-fashioned military or religious reasons. Instead, these abbreviated engagements reflect modern mating trends: couples who date, if not live together, for years and years, to the extent that a protracted period between the proposal and the ceremony seems pointless (it's not as if William and Kate need time to get to know each other). Then there are older, sometimes second-time brides and grooms with the wisdom of past relationships under their garter belts who are eager to get other milestones, like baby-making, going. And then there are couples quietly rebelling against an industry that they say pressures them to spend 14 to 16 months — the average engagement length, according to a 2009 Conde Nast American wedding study — saving up for their dream day. (Average cost: $28,082, according to the same report.) Still other couples say it's not the day they're out to emphasize, but the years that come after. "We put a lot of time and effort into thinking and talking about our marriage as opposed to thinking and talking about our wedding," says Brandy Egan, 37, a nurse from Drexel Hill, Pa., who married her husband, Matt, last May after a five-month engagement. Not only are the newly engaged realizing the significance of taking the focus off of the wedding ceremony and repositioning the importance on to the marriage itself, but many also want their nuptials to reflect their own generation and personality as a couple. "For most people, getting engaged is not a significant change in their status in life," Roney says, vs. a generation or so ago, when it was the time to make a commitment public and introduce future in-laws. Now, by the time many grooms get on bended knee, "all that's already happened." Heck, some couples have even bought a house together. Or had kids together. After, say, six years, two dogs, one house and one child, "it's hard for an engagement to mean anything special," Roney says. So why not shrink it to its most basic components? "At the heart of every wedding is telling your own story," says Millie Martini Bratten, editor in chief of Brides magazine. "Some people's vision is very simple": a cozy City Hall ceremony plus restaurant party, for example, or an intimate destination event in the Caribbean. Neither scenario requires months of preparation. The goal in these cases is "getting people together and having a lovely party," Bratten says, "but not a big party with spectacular decor." One ideal element of a short sprint down the aisle can be the absence of stress from the heightened expectations that can build during a lengthy planning period. "The long engagement can glamorize what a wedding is," Sabartinelli says. When it came to her 125-guest affair, "I was so tired. I didn't eat. I met way too many people I didn't know. The whole night is just a blur now. I keep thinking that if I had had a year-long engagement, I think I would have felt pretty disappointed the next day, going, 'I did all that work for this?' "
Whether it is a 2 years or 2 month engagement, the transparent message seems to be that engaged couples are just excited to begin their lives together as husband and wife. How long of an engagement period would suit your relationship and personality style? Traditional? Fairy tale-esque? Outdoorsy? Ultra mod? Each bride has her own personal wedding style. Follow the link below to Glamour Magazine's online quiz to find out which type you're most like, and then snag a few ideas for planning your perfect wedding! With so many inspiring weddings posted on the web these days, we wanted to spotlight a few from of our favorite wedding blogs. 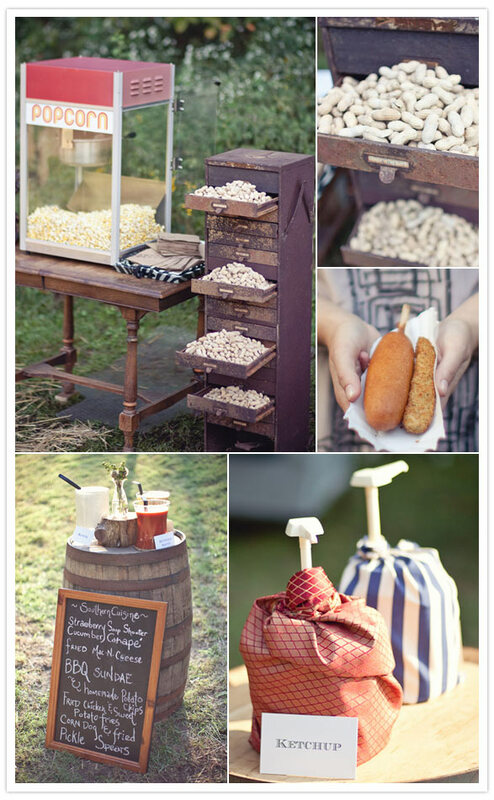 All of the weddings below offer a great look at special elements and DIY creations that made each wedding truely unique for the couples. Which elements are your favorite? 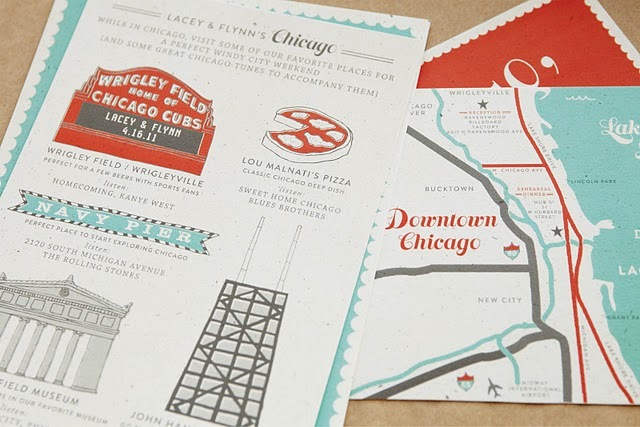 Brooklyn-based design house, Swiss Cottage Designs created a personalized wedding suite for a Chicago couple with intertwined elements of their favorite hometown landmarks, songs and baseball team. 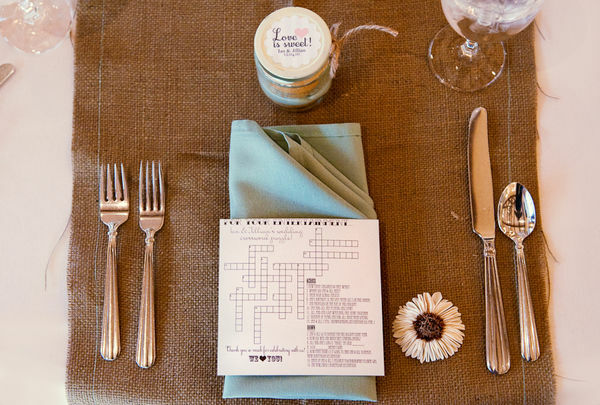 Jillian and her groom created customized crossword puzzles on the back of the thank you's at each place setting. Such an interesting way to do something fun while waiting for dinner. Erin and Brent, along with their families took over a year to custom make almost all of the wedding decor (including her dress!). They decided to carry the vintage circus theme all the way to their food and drink menues. 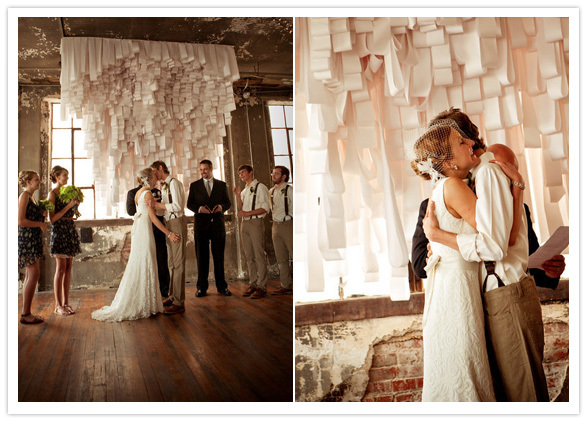 Inspired by something her wedding planners (The Wedding Company, Kansas City) had seen in the windows of Anthropologie, Bethany handcrafted the whimsical backdrop for her ceremony using receipt paper, foam board and a staple gun.